This new floor stand has been built with a small footprint base. 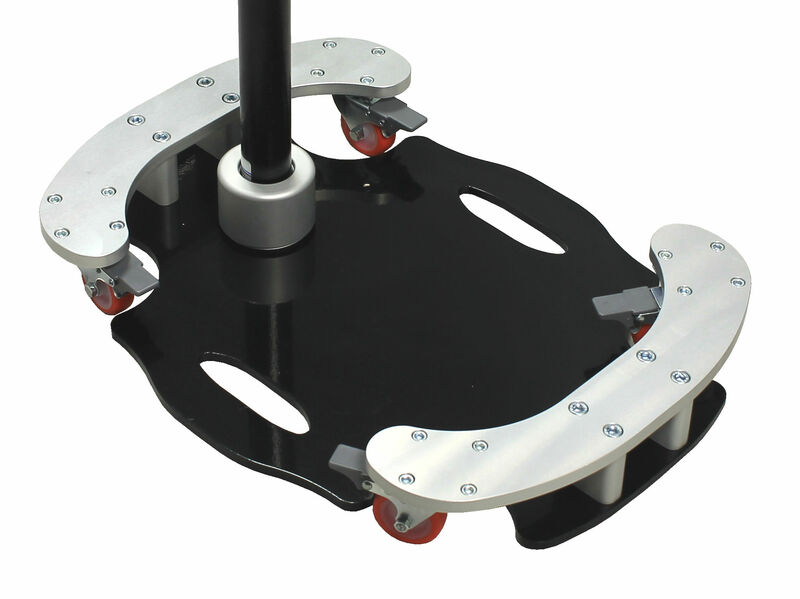 The base, designed and manufactured by Mounts and More, is low enough and narrow enough to enable it to go under most footrests and between most wheelchair front wheels. Combined with a short adjustable arm, this allows a direct access or switch operated device (under 2kg) to be positioned close enough for most users. Note: As a new product, please contact us to check availability. 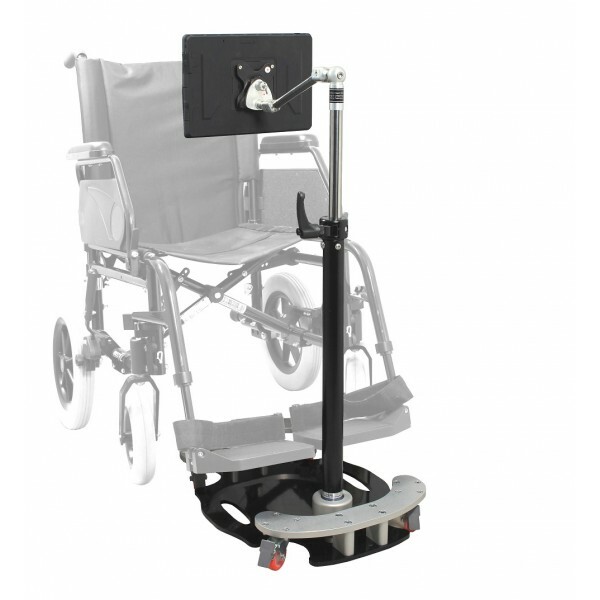 This model features an adjustable arm to position a device within reach of the user. With two articulating ball joints, this arm can position a device at the precise angle an individual user needs. This combination of joints was also chosen with safety in mind; the arm will intentionally not support heavier devices above 2kg. Short Arm with two adjustable joints. The base measures 20" long by 15" wide (51cm by 38cm) with a height of 3.125" (8cm) and has been designed to fit under the foot rests and between the wheels of most wheelchairs. This compact base size not only takes up less floor space when in use than traditional floor stands but is also easier to store, with an inbuilt hand hold making it easy to carry with the post removed. With safety in mind, the locking wheels are red and the wheel support brackets have a clear anodised finish for visibility. This floor stand includes a Daessy Short Rolling Mount Post which gives height adjustment from 29" to 47" (79cm to 108cm). 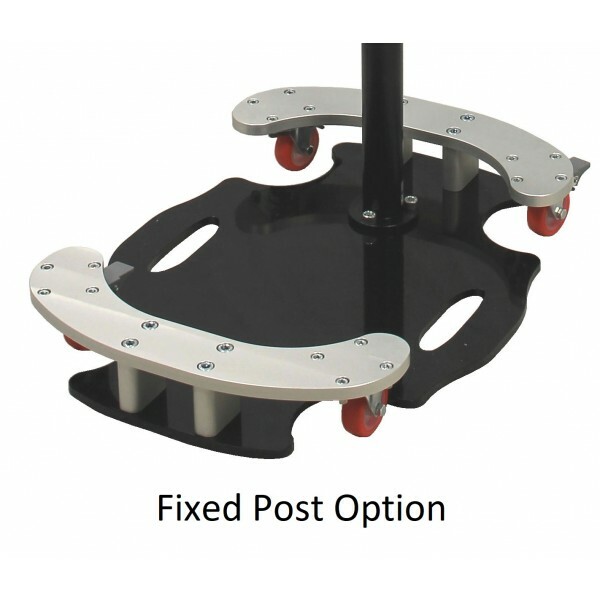 The floor stand is supplied as standard with a releasable adaptor for connecting the upright post to the base, this new design enabling the post to be securely attached or removed in a matter of seconds (see picture below). If the removable adaptor is not required, a fixed post option is available with the upright post bolted to the base. 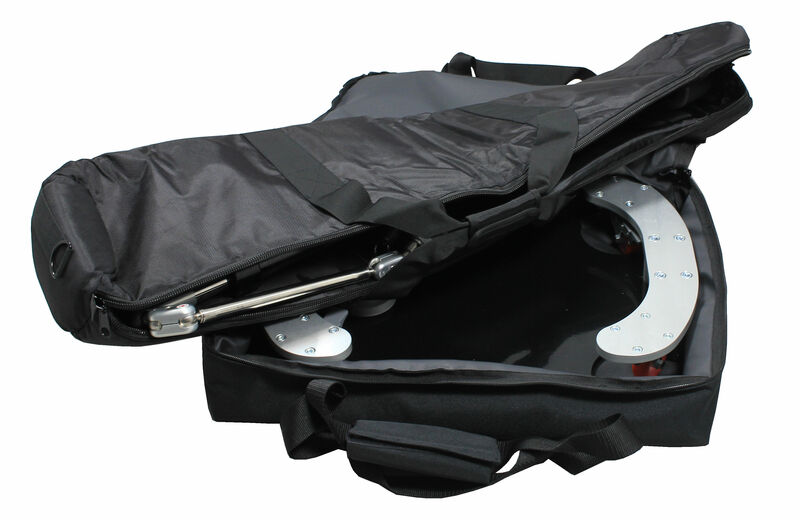 A new carry bag has been custom designed for the Mini Floor Stand Base. In combination with a mount carry bag for the upright post, these will protect the floor stand during transport or in storage. The pair of bags also make transport simple, particularly useful if the mount will be used in more than one location or taken out for assessments. Compact base size: 20" x 15" (51cm x 38cm). Ground clearance of 9mm (between ground and underneath of base). 3.125" (8cm) Base height, from the ground to the top of the wheel supports. This is the same base height as the Daessy Rolling Mount. Maximum supported device weight: 2.0kg. Daessy Short Rolling Mount Post, giving height adjustment from 29" to 47" (79cm to 108cm) - the height being the position of the quick release base above the ground. Supplied as standard with Removable Adaptor to quickly attach or remove the upright post. Can be supplied with manual bolt fixing if preferred. Short arm with two adjustable ball joints to position a device under 2kg close to the user for direct access.